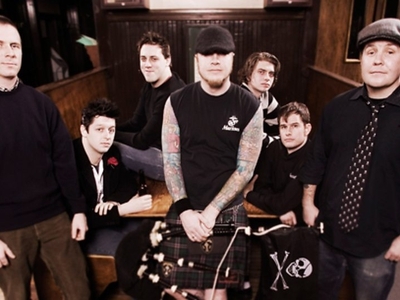 Dropkick Murphys are an American punk rock band formed in Quincy, Massachusetts in 1996. The band was initially signed to independent punk record label Hellcat Records, releasing five albums for the label, and making a name for themselves locally through constant touring and yearly St. Patrick's Day week shows, held in and around Boston. The 2004 single "Tessie" became the band's first and one of their biggest charting singles to date. The band's final Hellcat release, 2005's The Warrior's Code, included "I'm Shipping Up to Boston", which was featured in the Academy Award-winning movie The Departed and went on to become one of the band's biggest singles, one of their most well-known songs, and an anthem for Boston sports teams.